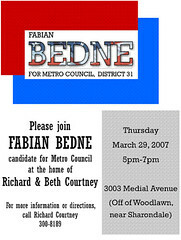 We would like to make sure everyone knows that Fabian Bedne is a candidate for Metro Council. Fabian was a founding board member for National Association of Hispanic Real Estate Professionals (NAHREP) chapter in Middle Tennessee and was integral in its formation and structure. He was our Secretary and worked endless hours for the organization. He has a strong heart for helping the Latino community. Bedne is a native of Argentina and has a background in architecture.